One of the highlights during our 2-night stay in Baltimore was our visit to The Historic Ships of Baltimore, a maritime museum located in the Inner Harbor of Baltimore, an opportunity too good to miss for a nautical buff. An affiliate of the Living Classrooms Foundation, it represents one of the most impressive collections of military vessels in the world. Exhibiting life at sea, from the mid-19th century to the mid-1980’s, it was created as a result of the merger of the USS Constellation Museum and the Baltimore Maritime Museum. The museum’s collection, all located within easy walking distance of each other, features four historic and well-maintained museum ships from four different times in history. The USS Constellation, a 1854 sloop-of-war in Pier 1, was the last all-sail warship built by the US Navy. The USCGC Taney (WHEC-37), a Coast Guard cutter in Pier 5, is the last surviving vessel to witness the December 7, 1941 Japanese attack on Pearl Harbor. The USS Torsk (SS-423), a World War II-era, Trench-class (one of 10) submarine in Pier 3 commissioned in 1940, torpedoed the Coast Defense Vessels #13 and #47 on August 14, 1945, the last two enemy combatants of World War II. The Chesapeake, a lightship (which marked the entrance to the Chesapeake Bay) in Pier 3 built in 1930, was a navigational aid with beacons mounted on it. Also included in the collection is the 40 ft. high Seven Foot Knoll Light, a screw-pile lighthouse in Pier 5 built in 1856. One of the oldest Chesapeake Bay area lighthouses, it was erected at the mouth of the Patapso River, on a shallow shoal called the Seven Foot Knoll. For over 130 years, it marked the entrance to the Patapsco River and Baltimore Harbor. The three ships (USS Constellation, USCGC Taney and the USS Torsk) are National Historic Landmarks and all five are listed on the National Register of Historic Places. Jandy, Kyle and I availed of the Squadron Pass and visited the USCGC Taney and the USS Constellation (by far, our favorite). Our interesting and educational visit gave us a good overview of different parts of the nautical world and of Baltimore’s heritage as a major seaport. Both ships were amazing to walk through as they had much of their original furnishings (like uniforms, desks, etc) for effect (where needed, accurate replicas where made). Historic Ships in Baltimore: 301 East Pratt St., Baltimore, Maryland 21202-3134, United States. Tel: 410-539-1797 (Main Office) and 410-396-3453 (Group Sales/ Education Office). Fax: 410-539-6238. Open daily, 10 AM – 4:30 PM. E-mail: administration@historicships.org. Website: www.historicships.org. Admission: US$18 (Fleet Pass – 4 ships entry), UUS$15 (Squadron Pass – 2 ships entry). Tickets may be purchased on-line or at ticket locations on Pier 1, Pier 3 or on board the USCGC Taney. Admission is free at the Seven Foot Knoll Light. After touring Bacarra Church, Melissa, Almira, Albert, Jandy and I again boarded our bus or the 33-km./40 min. drive to the century-old (first lit on March 30, 1892) Cape Bojeador Lighthouse, the most accessible of all the lighthouses in the island of Luzon and the highest elevated (the tower of the Cape Melville Lighthouse is the tallest at 90 ft/27 m.), still original and active Spanish era lighthouse in the country. In Brgy. 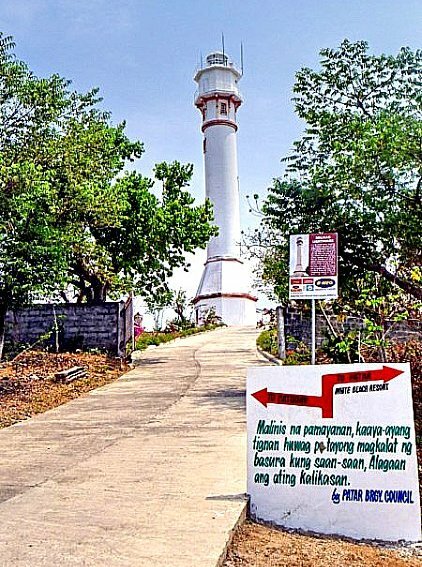 Paayas in Burgos, a sign on the right side of the Maharlika Highway indicates the winding and narrow, two-lane concrete road that leads to the base of the lighthouse. From the base, we boarded two tricycles (PhP50/each way) that took us to the small parking lot where there are stalls selling ice candy, canned soda, some finger foods and souvenirs (including a wooden craft replica of the lighthouse with a pen stand). Upon arrival, we climbed a flight of concrete stairs to the perimeter wall. Here, we had a good view of the rough and rocky Cape Bojeador coastline and the whitecaps of the West Philippine Sea. We then proceeded to the courtyard where the service buildings and the cistern are located. An elegant T-shaped stairway then lead us up the verandah of the main pavilion, with its 3 apartments, 2 offices, capiz and louvered window panes and decorative iron grilles, where a hallway took us to the foot of the covered stairs that that lead to the entrance of the 20 m. (66-ft.) high octagonal stone tower. This was as far as we could go as no visitors were allowed to go up, via a steep spiral metal staircase (not recommended or senior citizens), to the lantern room (now a modern electric lamp powered by solar panels) on top. Only a certain number of people are allowed in the tower at a time and access to the viewing gallery (surrounded with decorative iron grille work) depends on the outside wind condition. As it was Holy Week, it was closed to visitors. One place we had access to was the small, newly restored Cape Bojeador Lighthouse Museum. 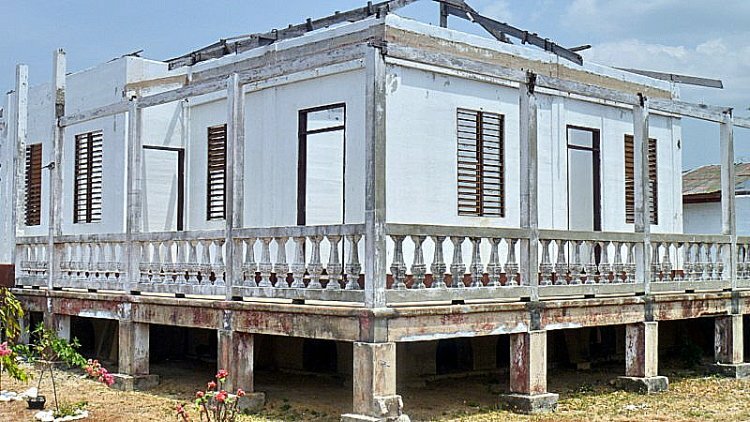 Housed in the pavilion at the foot of the Cape Bojeador Lighthouse, the rooms lining the hallway used to be shut but, since its inauguration last November 21, 2015, it is now open to the public. At the time of our visit, the rooms were sparsely decorated with low wooden furniture, including four-poster beds by the windows. One room was filled with items that were once used to run the lighthouse (the original kerosene lamp, batteries, a part of the original first order Fresnel lens, etc. ), perhaps the most striking in the area, plus samples of original brick work and old photos. We also dropped by the Paru de Kabo Bojeador, the new tourist center which has stalls selling souvenirs and a safe resting area on what had previously been a construction road. The pavilion has also been transformed into lodging for people seeking basic accommodation (except for shared cooking facilities and water from the cistern, no other amenities are provided). 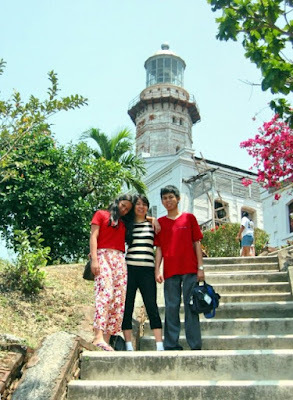 Cape Bojeador Lighthouse: Vigia de Nagpartian Hill, Burgos, Ilocos Norte. Admission: PhP40 for adults and PhP30 for children aged 7-12 years old. After our visit to Bolinao Marine Laboratory, we were invited by our host for lunch at Bolinao‘s Tourist Center. After lunch, we next drove up a 107–m. (351-ft.) high promontory in Brgy. Patar called Punta Piedra Point. On top was the century-old Cape Bolinao Lighthouse, built by American, Filipino and British engineers in 1903 and one of 5 major lighthouses in the country. The original apparatus was made in England and its lantern, with three wicks and chimney, was imported from France. This 30.79-m. (101-ft.) high lighthouse, the second tallest lighthouse (after Cape Bojeador Lighthouse in Burgos, Ilocos Norte) in the country and 1 of 2 in the town (there is another small lighthouse in Guiguiwanen, Brgy. Luciente 1), guards the entrance to Lingayen Gulf and its light, could be seen 44 kms. (26 miles) out. It is operated by the Philippine Coast Guard (PCG). During the lighthouse’s first 80 years of operation, it was fueled by kerosene . When the Pangasinan I Electric Cooperative extended its power lines to Patar, the lanterns were powered by electricity. Just like my first visit in 2005, I wasn’t able to climb its 134-step winding stairway as its gate was locked and the caretaker nowhere to be found. It was also depressing to see the destruction wrought by Typhoon Emong which unroofed its administration building. Solar panels which recharged its two beacon lights, set up via a 1999 loan package extended by the Japanese government, were also destroyed. Just the same, the lighthouse still remains an attraction by itself. Spectacular sunsets and the deep blue sea can be watched at its view deck. We woke up very early in the morning to overcast skies and rain. After breakfast at the Cagayan Holiday & Leisure Resort, we all checked out of our villa. We left our luggage at the hotel lobby for transport to the Eastern Hawaii Resort, later to be our second home in Sta. Ana. Thus unburdened, we all boarded our CEZA coaster for the fish port at Brgy. San Vicente. 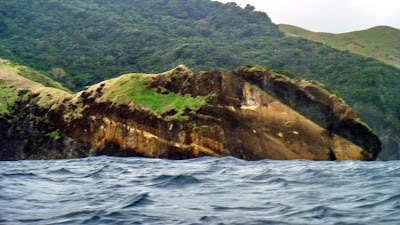 Point Escarpada, in Brgy. San Vicente, the sailfin capital of the Philippines. It has the best fishing grounds for marlin, being at the confluence of several ocean currents that carry baitfish and the larger pelagic predators that hunt them. 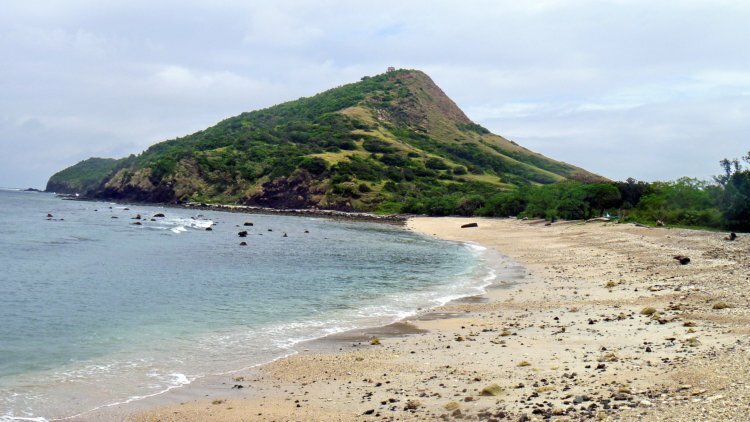 At the port, 5 motorized outrigger boats were chartered to bring us to the undeveloped and seldom visited, 3,850-hectare and volcanic Palaui Island, a 7,415-hectare Protected Landscape and Seascape with a shoreline of 20.6 kms., a length of 10 kms. and a width of 5 kms.. The island is inhabited by a community of Dumagats administered by a Filipino church group and is also home to different monkeys, wild pigs, deer, sea turtle and various endemic and migratory birds. The skies were still overcast when we left port. With me in the boat was Astra Alegre, Izah Morales, Kara Santos, Nina Fuentes and Kim Madridejos. Our 45-min. boat ride was uneventful until we reached open water when the sea suddenly became choppy, creating mild to wild panic among the other boats but childish exhilaration (except for the visibly worried Astra) with me and my companions with every rising wave. We first made short landfall at a gray sand Siwangag Cove for some photo ops then returned to our boats for our final landfall at a gorgeous bay with a curving white sand beach and well-preserved coral. The beach looked really inviting but we weren’t here for swimming or snorkeling. Instead, we opted to visit its picturesque old Cape Engaño Lighthouse (Faro de Cabo Engaño), the northernmost Spanish-era lighthouse in the country. Located on the windswept headland of Punta Engaño, it was designed by Engr. Magin Pers y Pers, started in 1887 and completed on December 30, 1892. 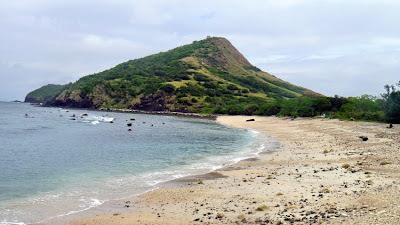 Upon reaching the end of the beach, we began our ascent up a mildly sloping to steep trail up the 92.75 m. high, cone-shaped hill, pausing at intervals to admire the Batanes-like scenery of its surroundings. After a 30-min. hike, we finally reached the lighthouse. Though now run down and a little eerie, it was obviously a sight to behold during its heyday. The back of the lighthouse had a panoramic view of the rolling waves of the Pacific Ocean breaking on the beach and rocky shore, the rolling, green-carpeted hills below, the two rocky islands of Dos Hermanas beyond and, farther off, the Babuyan group of islands, leaving all of us awestruck by the sheer beauty of nature before us. It was already drizzling when we went down the hill and returned to our boats. The return trip was just as exhilarating as the previous. Upon arrival at the port, a prepared lunch adobo and rice awaited us at the nearby picnic huts. About 25 kms. out of Pagudpud, past Bangui, on our way to Bauang (La Union), we made a short stopover at Cape Bojeador Lighthouse, Burgos town’s famous landmark. Designed by Magin Pers and Pers in 1887, first lit on March 30, 1892 and still in use, this 19-m. (57-ft.) high lighthouse, also known as the Burgos Lighhouse, is one of the highest in the country. It is perched on 160-m. high Vigia de Nagpartian Hill, between the low shrub Ilocos Mountains and squat coral cliffs facing the northern portion of the South China Sea. A 45-km. (1-hr. ) drive from Laoag City, it could be reached by steps from the Maharlika Highway at Km. 536. The octagonal lighthouse, topped by a bronze cupola, was made of lime, sand and water reinforced by a mixture of molasses and a sticky by-product of the rubber tree known locally as ablut. Too bad we couldn’t climb its narrow iron spiral staircase to the lantern room (now a modern electric lamp powered by solar panels) and its viewing gallery surrounded with decorative iron grille work as the lighthouse was then undergoing a much-needed rehabilitation and we could only admire it from outside. Just the same, we still had a breathtaking view, from the hill, of the surrounding expanse of the rough and rocky coastline of Cape Bojeador and the whitecaps of the South China Sea.